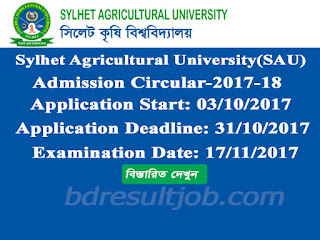 Sylhet Agricultural University (SAU) Admission Apply instruction, Payment Instruction, Admit Card information, Seat plan, Admission test mark distribution and admission test result has been published. 1. 100 number MCQ Question for 1 hours. Question subject Physics, Chemistry, Mathematics, Biology, Zoology and English. After complete the payment successfully reserved the transaction ID and visit http://www.sau.ac.bd put your application ID and Transaction ID and submit and download your admit card. 01/11/2017 to 07/011/2017 will published admit card http://www.sau.ac.bd. Every candidate Login their appliaction account and upload recent (300*300) pixel within 100KB color Photo and download Admit card Print this Admit card A4 size paper. Sylhet Agricultural University (SAU) Test admission authority will published seat plan before 03 (three) days on Visit http://www.sau.ac.bd and inform Mobile SMS. 19 November, 2017 will published Admission Test Result. Any applicant can download and view from Sylhet Agricultural University (SAU) official website http://www.sau.ac.bd search their Admission Test Roll Number. 12 November, 2017 will published Admission Test Result. Any applicant can download and view from Sylhet Agricultural University (SAU) official website http://www.sau.ac.bd search their Admission Test Roll Number. Tags: www sau ac bd, Sylhet Agricultural University (SAU) Admission Circular 2017, Sylhet Agricultural University (SAU) Admission Test Result 2017, Sylhet Agricultural University (SAU) Admission waiting list 2017, SAU Admission Circular, SAU Admission Notice, SAU Admit Card Download, sau Seat Plan, sau Admission Mark Distribution, Sylhet Agricultural University (SAU) Mark Distribution 2017, SAU Admission Test Result, SAU Undergraduate Online Application 2017. 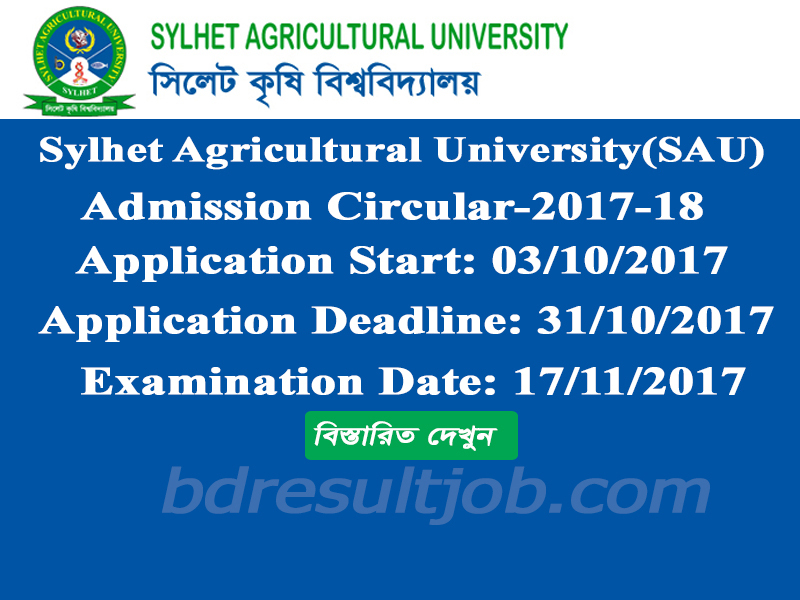 Sylhet Agricultural University (SAU) Admission Test Circular 2017-2018, Sylhet Agricultural University (SAU) Mark Distribution 2017, SAU Admission Test Result, SAU Undergraduate Online Application 2017.